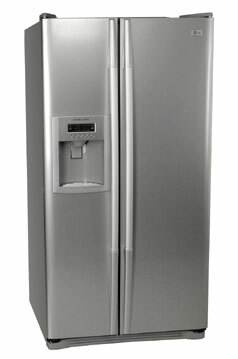 Will I have a fridge for New Year? It seems so, YES! No thanks to Darty, however. I went there last night and waited, a lone figure in a sea of white cases. I might still be waiting had I not given up after ten minutes, the lack of sales assistants a glaringly obvious cause of sliding sales... However, not wishing my feet to become petrified to the floor, or die of starvation before I was served, I went to Carrouf instead. In Carrouf, I immediately found the sales assistant and showed him the fridge I wanted which, joy of joys, was on promotion. I advised him of my dire need for it to be delivered before Thursday because there was no way I could cope fridge-less over New Year. He must have understood my plight, because he said he would check the stock. Unfortunately, there were none, only the more expensive white version (not on promo) and ordering from the depot wouldn't get it to me until Friday. So I suggested that I could have the one on display, and have it delivered on Wednesday. He hummed and ha'd a bit but I did more helpless, desperate female act, which wasn't difficult as it was exactly how I felt, and he said that would be okay. So, Cinderella, you will go to the ball, and I will have a fridge for New Year. The thought of preparing party meals with no fridge was just a nightmare, and I was on the point of cancelling everything and retiring to my bed with a temperature and bottle of gin. No need, however, YIPPEE! All I have to do now is clear out the existing fridge, clean underneath and get it ready to be carted off. No small task as it's covered in magnetic letters and bits and bobs on the top (cake stands, empty jars, roasting tin...), all dusty and needing a new home. The bin beckons for most of it... I'd much rather have those magnetic words that you can make into poetry or a little story now that the boys are older. They never did play with the letters. Visitors to the house (such as NG) used them way more than the boys! Ah well, all one can do is provide the means to improvement. You can't force it down. I'm now looking forward with pleasure to the next couple of days (even though I have to venture out shopping tomorrow afternoon...!) instead of with pure horror and dread. It's the little things... 511litres worth that make all the difference. I did manage to throw the magnets away. They all went in a flurry of clearing out old stuff - out with the old, in with the new. It felt good too as they kept falling off and gathering in a dusty mess just under the fridge. Happy New Year to you too, Gigi.